Some of the recent comments on Pam's cheating post focused on centerboards. I have some very strong opinions on this. When I first arrived in Sydney more than 40 years ago, I was fortunate to meet Frank Bethwaite and was able to assist with some wind tunnel testing and NS-14 class management. Frank's company at the time was called Starboard Products (now Bethwaite Design) and one of its specialties was making rudders and centerboards. Frank started with raw lumber, used an ingenious routing machine to get the rough shape, then shaped by hand, and then painted them with 2/3 resin and 1/3 thinner. The results were spectacular, and all of the high-performance boats in Sydney used them. One of Frank's first overseas clients was a Tornado sailor in Hawaii. Frank made a beautiful set of CBs from alternating light and dark wood, and the craftsmanship would have put most cabinet-makers to shame. They were beautiful, but the best part came later. The Tornado sailor was so pleased that he wrote Frank explaining that they were so fast that he had to de-tune the rest of his boat just to make it fair for the other sailors. I learned that, yes, CB shape is really important. The Starboard Products logo (drawn from memory) shows Frank's belief that sailing is really about two foils - one in the air and one in the water. It was a great logo because it showed the importance of what very few people at the time knew - what's under the boat is just as important as what's on top. Sadly, wooden foils were phased out in the late 80's. At the 1992 US Laser Masters, one of the competitors brought along wooden foils that were in pretty bad shape. But I knew that Frank could restore them, so I traded my new white foils for the old wooden ones (the guy thought I was nuts). Off they went to Sydney, Frank restored them (with notes assuring me that the shape had not been altered), and Mark brought them to the 1993 Master Worlds in New Zealand. Call me old fashioned, but having beautiful, legal, wooden foils from Frank was like owning a piece of history. And then someone objected, saying that this would give me an unfair advantage. I thought, how can this be? Everything was from an authorized builder and the foils were restored to their original shape. Jeff Martin's decision was that he could not prevent someone from protesting me, so I decided to sail the Worlds using the rudder and CB supplied with the charter boat. My gorgeous wooden blades have a sentimental value but have never been used at a national or Worlds competition. People must have had some pretty strong feelings because after the Kiwi Worlds, the class added a rule stating that a wooden rudder or CB could not be used on boats manufactured after a certain date. I have never understood this because they perform the same and its easier to alter painted blades. Fast forward to another national championship, where a good US sailor and I went out to practice. This fellow had the most amazing trick - going upwind in waves he would sail with his bow one foot behind my rudder... and stay there. Like, I could not shake him loose. It was like he was drafting behind me upwind. I thought, that's a trick I have to learn because it would be like a get-out-of-jail-free card off the starting line if I was pinched off by the boat below me - I'd just slip behind and then draft. But when we switched places, I could not and have never been able to make this drafting work. On shore, I asked this fellow how he did it. He just smiled and said, "it's the centerboard." 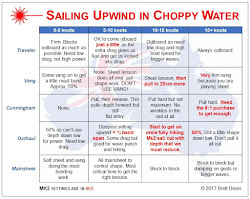 He explained that he had borrowed this tricked-out CB from a very well-known NA sailor and it made all the difference. This was my first exposure to altered CB's. All I know is there appears to be more than one way to make them faster and it costs at least $500. I have since seen them used at national and Worlds events, but people don't like to talk about it. The closest explanation I ever got was "if you want to win, you have to have one." The Aussie Laser that I bought 3 years ago came with the brown CB and rudder (these now come painted white). While I do not understand the reason the manufacturing process was changed, I liked the brown boards because they would be nearly impossible to alter. And I disagree with those who think that you need a cheater CB to win. I've won two Master Worlds and, with some hard work and a little luck, look forward to maybe doing it again. Hear hear!! Great post Doug. 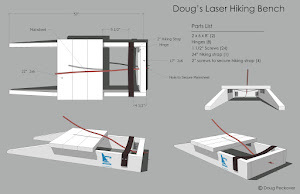 I have no doubts that well made wooden foils for a Laser would be vastly superior, and from the few I've seen, they were very well made. For one thing, they are much lighter and have more positive buoyancy. I have read that the current rudder assembly has negative buoyancy, but a wooden rudder blade assembly has a positive one. The Laser would definitely benefit from extra buoyancy at the transom. I have made a few sets of foils for other boats, the last being for my Goat Island Skiff. These foils are made to a NACA section from strips of Paulownia, a very stable, low density timber and then covered with glass. They weigh almost nothing by comparison to the Laser foil, even though they are somewhat bigger. The performance they give the GIS is astounding and I've no doubt that similar foils would enhance the Laser's performance considerably also. I am intrigued by your story about the drafting, enhanced by his special CB. I can believe it. The Laser foils were changed to improve the manufacturing process, the durability and quality. The old ones had steel reinforcing and I'm sure you've seen what happens to some of them that have begun to rust? However, the new ones are still manufactured to the same weight tolerance so that the old boards are not made redundant. I still use the old type foils as they are in pretty good condition and I cannot justify the cost of new ones for the sake of it. That's really what "One Design" is all about, isn't it? Wait, wait, wait! I'm a little slow. Are the "new" blades (and I'm really not sure what new means) essentially as good or better than the "tricked out" blades? Or are the new blades still not as good as the tricked out blades? And what exactly is done to the tricked out blades? Doug is of the opinion that weight isn't a factor that would make a difference. Both float when in the water so even a 2 pound difference wouldn't make much difference in performance. He thought the tricked out blades were not only made of a different material but were shaped differently. The measuring at events is to simply slide the centerboard into a slot to confirm that no part of the board is wider than the the slot but the exact placement of the widest point of the centerboard isn't measured and Doug felt that movement of that point could definitely affect performance. But he has just pieced together overheard conversations over the years to form that opinion. Does anyone actually know what is being done to the tricked out blades and whether it provides an advantage at the top of the fleet against the "new" blades straight from the manufacturer? If people are paying more than $500, they must be getting an advantage. We need to stamp out this abuse. Protest if you see it. Whoa! If some people are not simply tweaking their foils in accordance with what is allowed under the Rules and are using non genuine foils, of course they should be protested as this is blatant cheating. This is unacceptable has to be stamped out as cheating is against the Laser class rules too. Now that this is on the table so to speak, I've seen some stuff at regattas that has struck me as rather weird, but I thought it was just a serious over-the-top case of caring for his foils. In this case the foils went straight into the bag and into the car after the race, before de-rigging. I did not see the foils until the boat was launched when they came out of the car immediately before launching. In other words, the foils were not visible the cockpit (or under the boat out of the sun) like all the other boats around the park. I really did not give it much thought until now as I did not think that cheating went on in Masters Lasers. I could still be wrong and this sailor could just be a nutter about his equipment, but it makes me think! *making the centreboard "gybe" so that the angle of attack changes and lifts the boat to windward. This works in some classes, but not others. *making the board thinner at the waterline than at the tip would provide flex and the extra thickness at the bottom provides more lift. There are probably other things but I can't think straight right now as the effects of a glass of RED are taking hold! You and Doug must have been at the same regatta with the "weird" behavior. It's pretty hard to protest another over a suspicion. The change would have to come in the measuring process. Sadly, the suspected offenders are predominately US sailors. If you are traveling to an event outside of your country, why would you incur the cost and risk of damage in transporting your blades if they didn't provide you with some advantage over the brand new ones that come with the charter boat? But who is going to keep track of whether you measured in your blades or the charter blades, unless the tricked out blades wouldn't measure in. The use of tricked out blades won't stop until the measuring process is changed to spot the difference, be it weight, point of thickness or any of the other things you mentioned that would make them better. And if the difference can't be spotted in the measuring in process, then you can only point toward suspicious behavior. Not enough to win a protest. More spot checks of boats coming off the water might be in order to discourage substitution of equipment. It's pretty sad if this is what's going on. By the way, the builder's weight tolerance for the centreboard is 4.43kg to 4.86kg. I am told that the new foils have the weight stamped on them. I don't think substitution is the issue. I think the tricked out blades measure in and the weight isn't suspect. Wow you guys are pretty right on, Oztayls hit it out of the park. In the end technology and money is really what it comes down to, of course knowledge and experience falls under the money part of it. Now imagine having your own cnc table and the ability to really play with shapes and then materials. These foils are made to a NACA section from strips of Paulownia, a very stable, low density timber and then covered with glass. They weigh almost nothing by comparison to the Laser foil, even though they are somewhat bigger. The performance they give the GIS is astounding and I've no doubt that similar foils would enhance the Laser's performance considerably also. Could this be a version of poorman's Sitka?? Maybe even better. I've heard the tricked out blades are being used at the highest level in both the masters and open fleets. Certainly our new ILCA President must be aware of the issue since he's plays at that level. It begs the question, if the powers that be know about this and have done nothing to change the measuring requiremetns to stop it, are they, through inaction, making the statement that the tricked out blades are in fact legal? That would seem to be what the decision is. The "tricked out" blades I'm aware of have been sent to the usual places people send their keelboats for having the bottoms done. The blades go in as the usual "old" blades, often damaged (trailing tip, waterline chip, etc), and come out pristine. They are repaired where damaged, and "recoated". The "profile" looks the same, so I don't know if the shape is changed in the process. Certainly, they pass Laser Class inspections (fit the template). The "paint" or "coat" sure seems more durable/harder than standard, but I believe that's allowed under "painting". I haven't heard of anyone having this done since the new GRP boards (white, not natural) have been available. Folks just buy the new ones. Water friction is less on a surface painted vs gelcoated. It maybe an advantage. Weird stuff happens at the molecular level and the boundary layer that attaches to the surface. I haven't read up on the latest thinking, but it can do your head in. Anyway, in our class paint doesn't really matter. 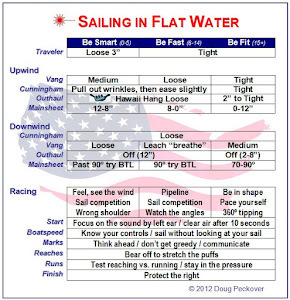 Much more important to concentrate on boat handling, trim, fitness, tactics and what the wind is doing! "Water friction is less on a surface painted vs gelcoated. It maybe an advantage." Not always. If the painted surface is left as sprayed it is actually sticky in the water. A sanded gelcoat at say 1500 to 1800 grit is faster / less sticky than a polished or waxed painted surface. Blades can be fabricated with lateral strips that actually change the angle of the centerline of the blade relative to the centerline of the boat. If done correctly a flexing centerboard could twist to weather adding significant lift almost like a second rudder. A very good friend ran a America's cup support team, he swore that faired paint was always faster then gelcoat. Both needed to be faired but the paint was faster. Hi Lindy, this is known a gybing centreboard, which I mentioned above. In some classes they are quite legal. We used them in Dabchicks (a small 12' scow) in the late 60's, but whether they actually worked was very much a debate.